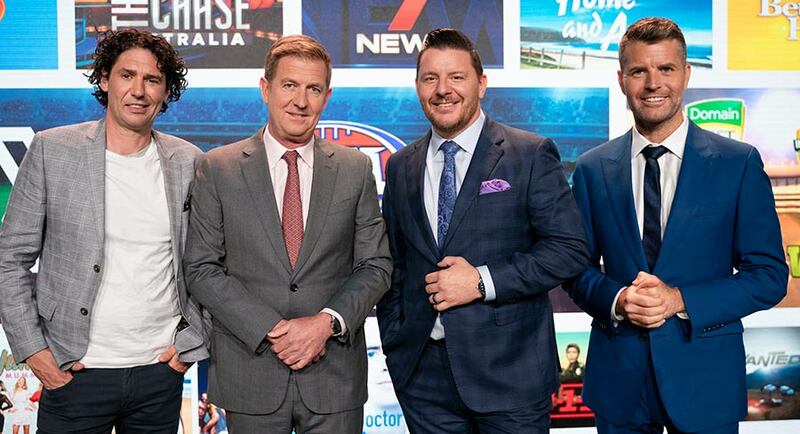 Seven CEO Tim Worner spoke with Mediaweek’s James Manning on Your Money on Friday after the Seven West Media Allfronts event. Here are some of the highlights. Is your partnership with News Corp in automotive a response to the Nine and Fairfax merger? I wouldn’t say that it’s necessarily a response to what else is going on with “frenemies”. I couldn’t say that it would have happened if that hadn’t occurred and you know what, it doesn’t really matter. What I do know is that the coming together of those two offerings in that automotive space is really compelling. Is this any sort of test case to other things you could possibly do with News Corp in the future? I wouldn’t say it’s an experiment or anything like that because I don’t think it’s going to fail. I think it is a compelling offering and we see it working. The nature of media in 2018 is that we’re all frenemies, we’re all talking with one another all the time. We have a very successful joint franchise with Nine in the facility space. We’ll see more commercial tie-ups. Whether or not we see more corporate transactions, I don’t know. You seem very confident of being able to double your online audience in two years. Our digital publishing business is already reaching about five million online Australians. We’ve seen what’s happened once we got our 7plus back from the Seven joint venture. We’ve had huge audience growth there as we’ve been able to take control of the curation of that content and the marketing of that content. We expect the same thing to happen when we get Seven news and short-form content back. In Q1 next year, we’ll be launching our online news offering and we expect to see similar audience growth and if we can pull that off it will mean that we’ll double that digital audience in the next two years. That’s the target that team has set for itself and I’m really happy to say that I didn’t drive them to that target. They’ve set that target themselves and they’re very confident they’re going get there. 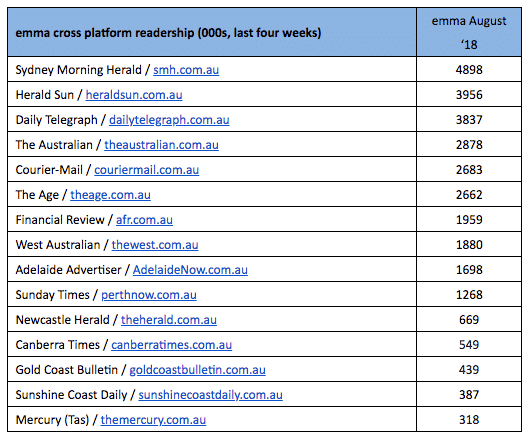 Digital news media readership has increased by 4% year on year and is now consumed by 13.6 million, or 74% of Australians, according to the latest emma (Enhanced Media Metrics Australia) data for August 2018, released today. Total print news media readership remains stable at 12.1 million, or 66% of the population. 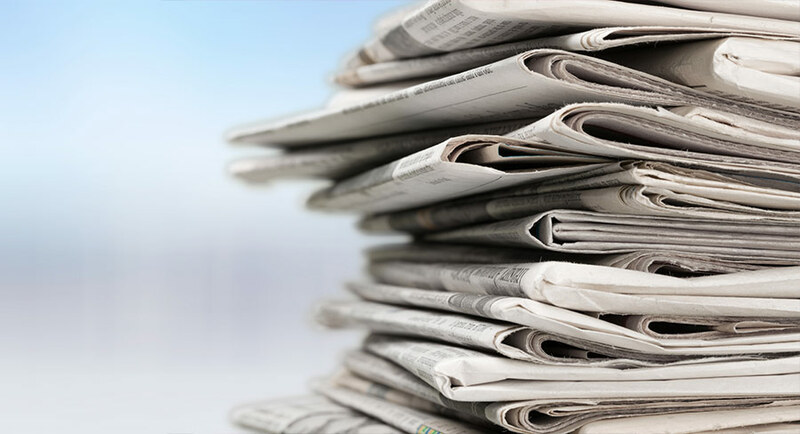 Across print and digital news media, 16.6 million, or 90% of people, read news media, demonstrating that the vast majority of Australians seek out their trusted news, entertainment and information in news media. Metro newspapers are read by 9.9 million people, or 54% of consumers. Regional and community newspapers are read by 5.8 million people, or one-third of the population (32%). In addition to the industry currency readership data, emma provides insights into Australian consumers’ product purchases, behaviour and attitudes. This data has revealed that news media readers love their sport and are avid fans of AFL, cricket, tennis and rugby league in particular. News media is read by more than 13 million, or 91%, of the 14.4 million Australians (aged 14+) who watch sport either on TV or live at the event. News media readers are also active participants in some type of sport, with 9.9 million regularly getting involved. “The emma CMV data shows that the most devoted sports fans are also the most involved, with heavy news media readers indexing the most profoundly against all major sports. News media reaches nine out of every 10 sports lovers with many of these readers more heavily engaged in newspapers. Couple this with the credible journalism that Australia’s most trusted media channel provides, and that trust positively impacts purchase intent. It’s got to be a compelling environment for advertisers looking to reach our sports enthusiasts,” NewsMediaWorks CEO, Peter Miller, said. This is the sixth month of emma cross-platform readership data to come from Nielsen, in a new strategic collaboration announced in May. Under the new arrangement, Nielsen leads the fusion process that brings together the industry-accredited print readership data from Ipsos and Nielsen’s IAB-accredited digital audience data, to deliver a total audience readership. Nielsen Consumer & Media View (CMV) is fused to the emma Cross Platform data to provide critical product and attitudinal data. The Sydney Morning Herald is Australia’s highest-reaching title across all platforms with 4.9 million readers. The Herald Sun followed, reaching 3.96 million readers, with The Daily Telegraph on 3.84 million (see table below). George Ezra has surrendered top spot to a track from A Star Is Born as Ezra’s Shotgun drops from #1 to #2 after 15 weeks on the chart. The two stars of the hit movie – Lady Gaga and Bradley Cooper – perform the music on the soundtrack. This is the first time Gaga has topped the chart since February 2011 when Born This Way was #1. The only other change to the top 10 was Billie Eilish debuting at #10 with When The Party’s Over. This is the second top 10 entry for the 16-year-old US singer-songwriter. A real cleanout of the top 10 this week with seven new entries and a further three new releases debuting inside the top 50. 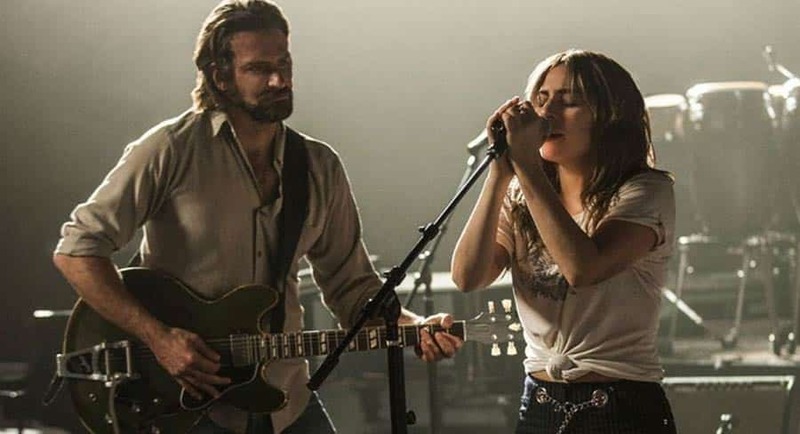 A Star Is Born week continues on the albums chart with the soundtrack catapulting Lady Gaga and Bradley Cooper to the top from #3 last week in their third week on the chart. This is Gaga’s third #1 album and the first since Born This Way in May 2011. #2 Rufus Du Sol with Solace. Third top three album for the Sydney act after the previous two albums debuted at #1. #5 Queen with Bohemian Rhapsody. Soundtrack to the movie, which is released this week. #6 Various Artists on Triple J’s Like A Version 14. A top 10 debut after the previous album landed at #1 in October last year. Call of Duty: Black Ops 4 holds its spot at number one this week. 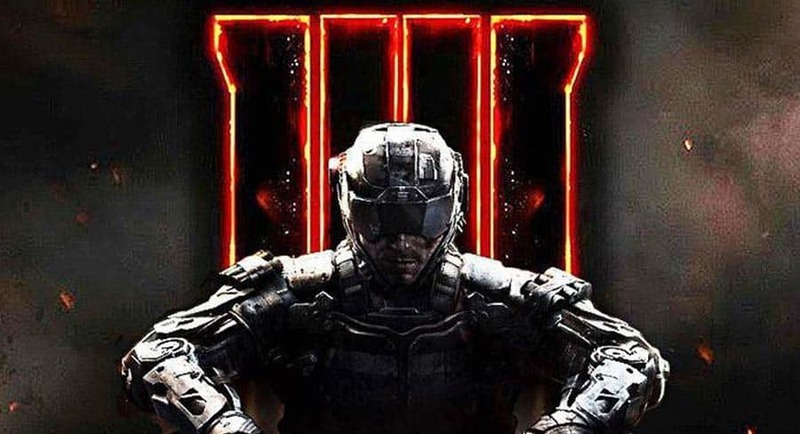 No surprise given how huge the series is, and how focused this instalment is on delivering a full multiplayer-focused suite, from the battle royale-inspired Blackout mode through to the co-op adrenaline rush of Zombies mode. It’s a strong package for Call of Duty fans. The most significant aspect of this week’s video games charts is the fact that for the first time this year the top ten is made up entirely of new(ish) games. 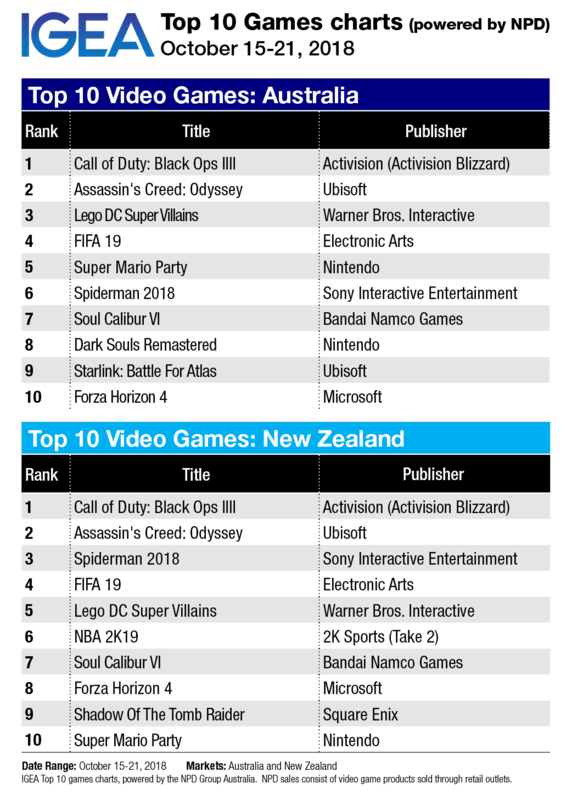 LEGO DC Super Villains, Soulcalibur VI, Dark Souls Remastered and Starlink have all been released recently and have all cracked the chart, while Assassin’s Creed: Odyssey, FIFA 19, Super Mario Party, Marvel’s Spider-Man and Forza Horizon 4 maintain places. The older classics that have been chart staples during quieter periods – Mario Kart 8, GTA V and Rainbow Six: Siege, to name a few – have now been bumped off entirely. There’s a lot for gamers to get stuck into right now, and Rockstar’s Red Dead Redemption II will start to make its presence felt from next week. Critics have hailed it as one of the games of this generation, and no doubt punters will feel the same. Nine had the biggest primary and network shares on Sunday and Monday last week, but then Seven took control with a winning network share for the remaining five nights of the week. Seven won four of those following five nights primary share with Nine the victor on Thursday. The network victory allowed Seven to claim to be #1 total people and in all key demos. Seven is also noting it is the only network to have grown share YOY in total people and all key demos. Seven has won 29 of the 34 non-Comm Games survey ratings weeks. Seven is also reporting its highest total people and key demos commercial share ever. Nine’s share was down a little with only two episodes of The Block last week. It won the network primary share week with a lead of just 0.1 ahead of Seven. Nine trailed more significantly in combined channel share with its three multichannels delivering smaller share than Seven’s. Network Ten’s combined channel share and primary channel share were up week-on-week, yet down on recent month averages. Its biggest nights last week were Tuesday and Thursday, with episodes of Ambulance Australia and Gogglebox driving audience numbers. With All Together Now up against The Block auctions, the episode was down to 510,000 after 675,000 last week. The series might need to recover well next week to maintain the mantle as Seven’s highest-rating new show of 2018. Sunday Night then did 531,000 as it too battled interest in The Block. The auctions episode of The Block worked like magic again this year. The unpredictability of the auctions in a market downturn heightened interest in the sale prices. There was no mucking about last night with host Scott Cam quickly revealing reserve prices and then taking the Blockheads through the auction order. The money started flowing after the usual auction jitters with Kerrie and Spence getting over $2.8m and a profit of $415,000. Hayden and Sara surprised everybody who was still thinking they made a mistake at the start of the season with their choice of apartment. However, their apartment was the only one to push above $3m at auction and they left the season with a total prize of $645,000. The episode did 1.68m with over 600,000 watching in Melbourne and over 460,000 in Sydney. For the announcement of who actually won, the audience climbed to 2.02m. That makes The Block the highest-rating reality grand final of the year. It is also the most-watched non-sports program this year. The auctions night in 2017 saw the Grand Final episode on 1.99m while Winner Announced did 2.46m. 60 Minutes followed The Block last night with 797,000. The Sunday Project started on 230,000 at 6.30pm and grew to 322,000 after 7pm. Jon Bon Jovi was the major guest last night. Game Of Games then did 256,000 after 325,000 a week ago. The audience then lifted to 308,000 for new NCIS. Kevin McCloud’s Top 10 followed the ABC News with 442,000, which isn’t a bad number for a property program up against The Block auctions. Pine Gap then followed on 362,000 after 433,000 a week ago. Ancient Invisible Cities was the channel’s best with 174,000. The moment the ink dried on the Nine-Fairfax merger announcement in July, speculation about a deal between Rupert Murdoch’s News Corp and Kerry Stokes’s Seven West Media kicked off, reports Fairfax Media’s John McDuling. Last week, in a sign the two companies are growing closer, a joint venture over advertising sales for the auto industry was established. Enterprising minds in the Australian investment banking landscape are convinced a more substantial corporate deal between them could make sense. And they’re working hard to figure out structures that could make that happen. One idea canvassed by bankers is that Foxtel, 65% owned by News Corp, could be the party involved in a deal with Seven, rather than News Corp itself. In theory, this would combine the top-rated free-to-air TV network and Australia’s biggest pay-TV provider into a business with 2.8 million subscribers, a strong advertising presence, and over $4 billion in combined annual revenue. Foxtel has pushed back the launch of its sports streaming service and is now aiming to launch it with Australia’s opening cricket Test match against India in December, reports The AFR’s Max Mason. And the pay TV provider is mulling whether to greenlight an entertainment subscription video on-demand play ahead of the final season of Game of Thrones. Foxtel had been targeting the launch of its sports streaming service, known internally as Project Martian, with its first exclusive match – a One-Day International between Australia and South Africa on November 4 in Perth. Pricing is expected to be between $19.95 and $25 per month for the sports streaming service. Melbourne-based Bastion Collective has bought a majority stake in Sydney group Banjo, creating what management claims to be the country’s biggest locally owned independent advertising agency, reports The Australian’s John Stensholt. The sale comes just after Banjo celebrated its 10th year in business, with co-founders Andrew Varasdi and Ben Lyttle having started with the backing of prominent investor Mark Carnegie and advertising industry legend John Singleton in September 2008. Carnegie sold down his stake last year with Singleton staying in as a silent partner with a 20% share. The Banjo co-founders will maintain a minority stake and their brand, becoming the 10th business under the Bastion model that sees its owners take majority stakes in its founder-operated subsidiaries. Jack Watts, Bastion’s chief executive, told The Australian the move was an attempt to combine aspects of the old Australian agencies that used to dominate the local scene with a modern way of doing business. Lisa Squillace, Seven’s digital sales director who has been hired by Ten to be its network sales director, has been in court fighting Seven’s application to enforce non-compete clauses that would stop her joining Ten before June 25, reports The Australian’s Stephen Brook. Three months’ notice ends on December 26, but Seven then wants a non-compete period until June 25, which Squillace reckons is a bit rich and so has launched adverse action proceedings. A secretive political group claiming to campaign against “hate speech in the media” has accused the Labor Party of behaving “like an arsehat” and added it to a blacklist of advertisers on Sky News, reports The Australian’s Brad Norrington. Sleeping Giants Oz, an anonymous self-appointed media morality judge, which floods Twitter with calls for consumer boycotts of brand advertisers when it disapproves of TV and radio content, has targeted Labor following party advertisements on Sky News advocating Bill Shorten’s “fair go action plan”. The group savaged Labor on Twitter for the party’s ads appearing on Sky News, likening them to “paying the bully to come to school and beat you up every day”. Big name brands on the Sleeping Giants Oz blacklist include Coles, Telstra, Fujitsu, Hyundai, Mitsubishi, Samsung, ING, KFC, Dulux, Carpet Call and the NSW Liberal Party. The proposed Labor blacklisting has stirred a negative reaction from Sleeping Giants Oz supporters protesting that its boycott-based strategy – intended to cause commercial harm – has gone too far. The ABC reporter allegedly harassed by NSW Opposition Leader Luke Foley at a 2016 Christmas party is reportedly feeling under intense pressure to make a formal complaint despite her fears it will damage her career, reports The Australian’s Deborah Cornwall. The explosive accusation, first levelled at Foley in the NSW parliament by Corrections Minister David Elliott two weeks ago, has sparked a leadership crisis for the ALP. It allegedly involves an incident at Sydney’s Martin Place Bar after a 2016 parliamentary press gallery Christmas party. Sources have told The Australian another journalist at the party witnessed the incident but the female reporter decided at the time not to report the event to her ABC bosses because of the professional and political fallout it could cause. TV and radio host Matty Johns has rocked Triple M management by asking to quit The Grill Team breakfast show after eight years, reports News Corp’s Phil Rothfield. “I need a break from the 4am alarm clock,” Johns told The Daily Telegraph when asked about rumours he met with Triple M boss Mike Fitzpatrick last week. “Yep, it’s true. I’ve just about had enough and I’ve asked them to consider another role in the business. Johns is under contract with Triple M until the end of 2019 but has asked for another, less demanding role. His radio co-hosts Gus Worland, Emma Freedman and Chris Page will be looking for a new teammate from January. 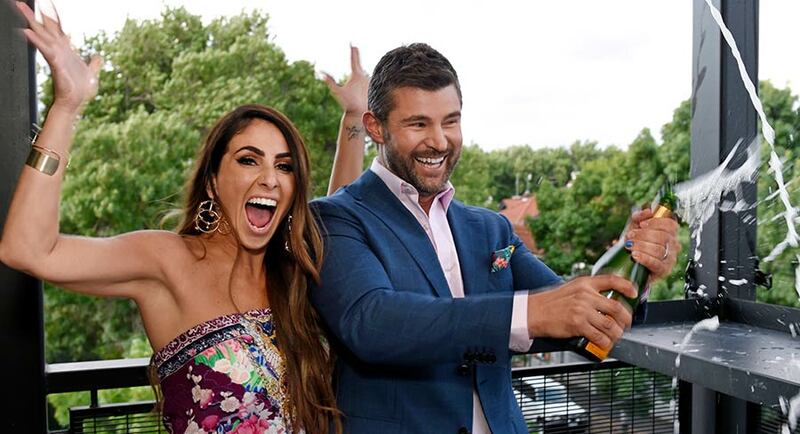 Kate Ritchie, Tim Blackwell and Marty Sheargold have spent nearly 900 hours talking to each other on their Nova drive show, reports Fairfax Media’s Nathanael Cooper. “And they still tell the same jokes,” former Home And Away star Ritchie quips. After initially spending two years on Nova Sydney breakfast with Merrick Watts and Tim Ross, it was followed by her current five-year run with Blackwell and Sheargold. “Absolutely, I do foresee (returning to acting) in my future and I would like to think there are plenty of people around me making those decisions that see that too,” she says. But in the meantime, Ritchie says she is incredibly happy where she is and doing what she is doing, and she admits that the shift into radio was a calculated move to help her shake off her Home And Away character Sally Fletcher both for herself and for people that may remember her that way. 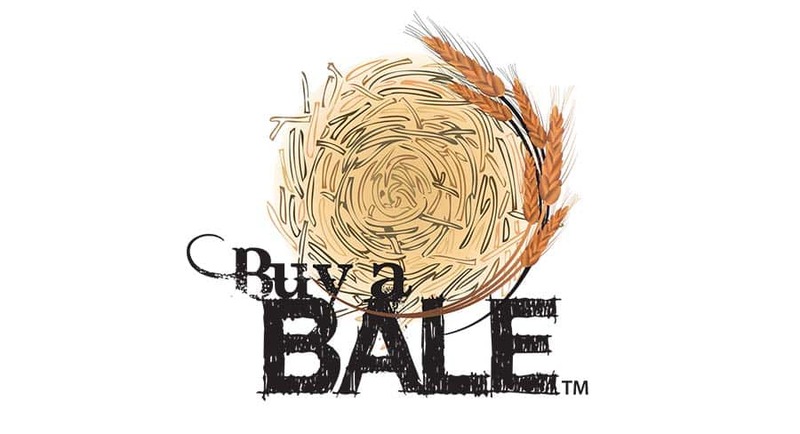 Nine’s Hay Mate: Buy a Bale concert to support Australia’s drought-stricken farmers has raised over $2 million. Nine’s Sonia Kruger, David Campbell and Richard Wilkins announced the final tally for the fundraiser – with the proceeds going to Rural Aid – to the crowd at Scully Park in Tamworth, the venue for the concert broadcast. The legendary John Farnham was the concert highpoint with his hit You’re The Voice as well as an encore performance of Long Way to the Top with Daryl Braithwaite, Andrew Farris, Guy Sebastian, Jon Stevens and The Veronicas. Braithwaite managed to make the concert after earlier in the day performing prior to the running of the Cox Plate at Moonee Valley in Melbourne. Event curator Glenn Wheatley said: “I speak on behalf of our farmers and say a huge thank you. And to the generous team at Nine, thank you for broadcasting into homes across Australia. It has been an amazing ride and I look forward to seeing the smiling faces of those families and farmers who have benefited from tonight’s efforts. It’s all been worth it. The AFL as appointed Sarah Wyse (pictured) in the new position as head of AFL Media Network. The role will oversee the core news, content, creative and production teams of the AFL’s news, digital and creative business – AFL Media. AFL Media was established in 2012, with a mandate to deliver world-class content for the AFL’s fan base, partners and new audiences across the entire AFL digital network (AFL.com.au, app, social, mobile). This new role will focus on optimising content for the elite game and growing the AFL’s engaged fan base while engineering innovative and creative ways for new audiences to experience the game into the future. Wyse joins the team after the recent appointment of former Nike executive and Western Bulldogs CEO Dave Stevenson in the role of head of audiences, products and innovation. 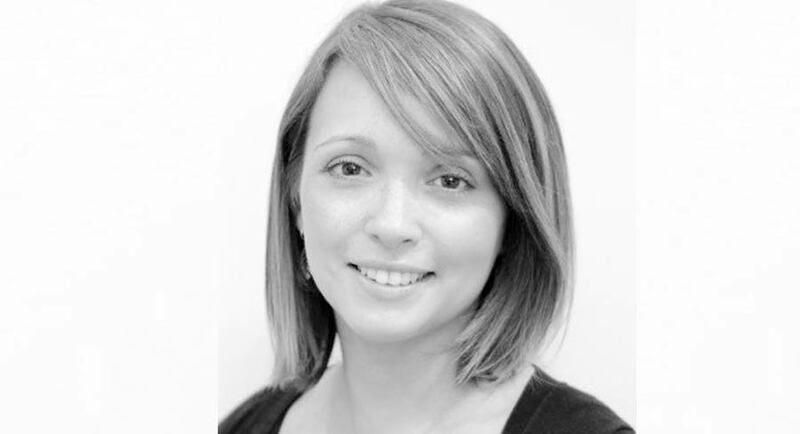 Wyse started her career in London at multimedia lifestyle publisher EMAP and has been living in Australia since 2008 taking on leadership roles at ninemsn, TVN Asia, Videology and Fairfax-owned digital publisher Allure Media.